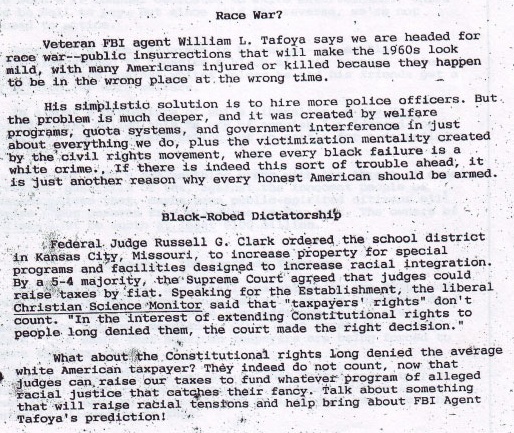 Veteran FBI agent William L. Tafoya says we are headed for race war–public insurrections that will make the 1960s look mild, with many Americans injured or killed because they happen to be in the wrong place at the wrong time. His simplistic solution is to hire more police officers. But the problem is much deeper, and it was created by welfare programs, quota systems, and government interference in just about everything we do, plus the victimization mentality created by the civil rights movement, where every black failure is a a white crime. If there is indeed this sort of trouble ahead, it is just another reason why every honest American should be armed. What about the Constitutional rights long denied the average white American taxpayer? They indeed do not count, now that judges can raise our taxes to fund whatever program of alleged racial justice that catches their fancy. Talk about something that will raise racial tensions and help bring about FBI Agent Tafoya’s prediction! Widow Evelyn Smith lives in a duplex in Chico, California, and rents half of it. As a devout Christian, she disapproves of people living together without being married, and when two prospective renters discovered that, they reported her to the state housing commission for discrimination. The commission ordered her to rent half of her house to people she didn’t want, and then fined her when she refused. In California, and if the liberals have their way, all across our country, property rights are virtually meaningless. Constitutionally and from the standpoint of our natural rights, we should be able to discriminate in renting or otherwise using our property–sexually, racially, religiously, ethnically, or just because we don’t like the person’s face. That we have lost that right, under the color of a supposed moral advancement, shows how far we’ve retreated from a free society. Concerned Women of America, a conservative religious organization, is helping Mrs. Smith appeal the unconscionable regulatory theft of her rights. But I am not optimistic, not in America 1990. What an outrage that, for the first time in our nation’s history, the organized forces of perversion were feted in the White House. When he signed the “hate crimes” legislation –itself a terrible act–President Bush invited the heads of homosexual lobbying groups to the White House for the ceremony. A Congressman Bill Dannemeyer (R-CA) noted, “It’s a tragic message that is being sent,” that normality and deviance are equal. Note: AIDS was originally named GRIDS–the Gay Related Immune Deficiency Syndrome. Political pressure forced a name change to try to hide the origin of this plague. 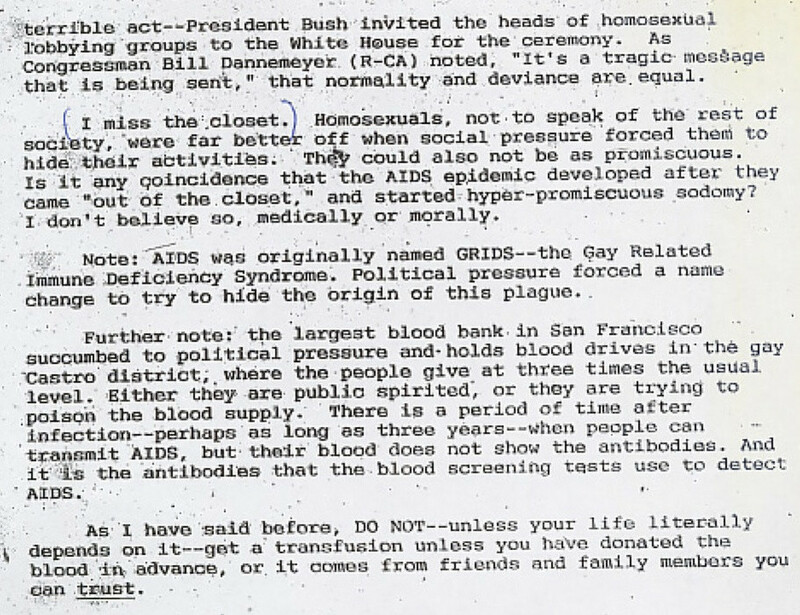 Further note: the largest blood bank in San Francisco succumbed to political pressure and holds blood drives in the gay Castro district; where the people give at three times the usual level. Either they are public spirited, or they are trying to poison the blood supply. There is a period of time after infection–perhaps as long as three years–when people can transmit AIDS, but their blood does not show the antibodies. And it is the antibodies that the blood screening tests use to detect AIDS. The criminal justice system in New York City is a joke. There are a zillion well-paid police, but they are of virtually no use. Not only are the streets terror zones, but home burglaries are not even investigated unless someone is hurt or more than $10,000 worth of property is taken! But the police and the prosecutors do take one form of crime seriously–competing with them. Defending yourself or others can get you in a lot of trouble, as young Kenny Mendoza found out. Kenny, a 19 year old, heard screams from a woman in a neighboring slum apartment. Grabbing a gun and rushing up the fire escape, he found a 30-year-old pregnant woman held by a criminal with a knife against her throat. Kenny shot the man, who had a long criminal record, and as a result–instead of getting the medal he deserves–he is being indicted for murder and criminal possession of a weapon. Several months ago, a gray-haired man was accosted on the subway by a gang of young pot-smoking, brandy-drinking animals. They started beating and kicking him after stealing his wallet and watch. When they pulled out a knife, he pulled out a gun, shot and killed one of the criminals, and calmly left the train. The police are searching for both heroes, who have not–thank goodness–turned themselves in, as cops and newspapers have urged. Expect more of this, as the big cities turn more and more into jungles. The innocent cannot–as usual–count on the government to be anything but an oppressor. They can only arm themselves and act, as Bernard Goetz did. This document is now on scribd: “Ron Paul Newsletter June 1990”. A scan of this newsletter can be found at @RP_Newsletter, “June 1990: The Ron Paul Political Report”. On August 19th, 2014, the full text for “Race War?”, “Black Robed Justice”, “The Abolition of Private Property”, “Private Justice in New York” and “The Pink House?” was put in. On August 19th, 2014 the link to this report was changed from a defunct one at the New Republic to scans at the blog @RP_Newsletter. On August 20th, a link was added to an upload of the document on scribd.